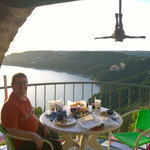 We went to The Oasis for (one of) our anniversary(ies)! 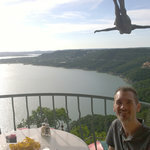 Here's David at our table in the crow's nest. Me at our table at The Oasis. 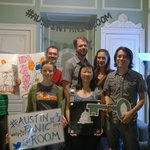 For Jess's birthday, we went to the Austin Panic Room, and made it out of the Museum room with 2:55 to spare! It was a lot of fun! 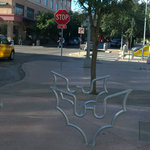 Bat-shaped bike racks outside the Austin Convention Center! 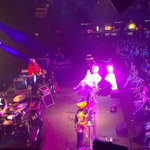 We saw Weird Al at the Moody Theater! It was a lot of fun. Weird Al playing his latest polka, which included Miley Cyrus's "Wrecking Ball". Weird Al and the band playing "Perform This Way". 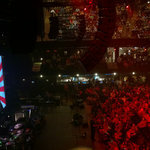 (hence the octopus costume) The show had many many costume changes. 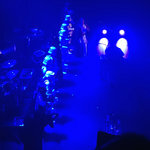 As a finale, Weird Al sang "The Saga Begins" and "Yoda", flanked by stormtroopers.